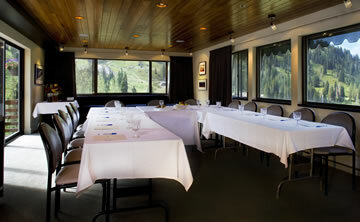 Alta Lodge has full conference facilities available. 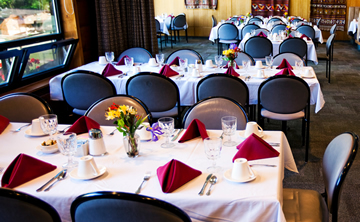 Our small size creates an atmosphere for a more intimate gathering with personalized attention. Rosie O’Grady at 801-742-3500 for planning and rates. Tax and 20% service charge are additional. Prices and rates subject to change. In the original wing of the Alta Lodge are the Lobby, Dining Room, Deck Room and Sitzmark Room. 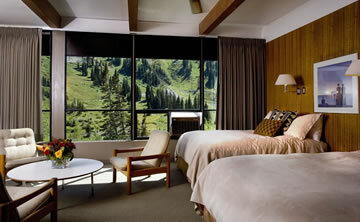 The newer steel and glass additions feature 44 rooms with extensive views of the mountains through wall-wide windows. Several rooms have a fireplace and a balcony. Sunday through Friday nights, lodging includes a continental breakfast featuring house-made baked goods. Saturday night lodging includes Sunday Brunch for two. Standard Double Room, 1 king bed or 2 twin beds—$99, Sunday-Friday, $129 Saturday. Large Corner Room, 1 queen bed & 1 double bed—$125, Sunday-Friday, $145 Saturday. Corner Room, 1 king bed or 2 twin beds, fireplace, private balcony—$145 Sunday-Friday, $165 Saturday.